Each basic algebra chapter is organized as a traditional algebra 1 textbook. Learn algebra chapter by chapter. Chapter 1: "Basic Algebra 1 Concepts" - Start with the basic algebra 1 concepts of real numbers, expressions, order of operation, algebraic properties, horizontal and vertical lines, sums & differences, products & quotients, solving equations, words to symbols and a comprehensive word problem solving section which includes the anatomy of a word problem, number problems, mixture problems, coin problems, finance problems, motion problems, and geometry problems. Learn algebra as each topic is introduced and explained with sample algebra problems followed by practice sets of algebra problems with the algebra solutions offered to the student step-by-step. This algebra software is your personal private algebra tutor. Chapter 2: "Inequalities & Open Sentences in One Variable" - Basic algebra students and continuing algebra 2 students will learn algebra by working through inequalities and open sentences by solving inqualities, solving combined inequalities, absolute value inequalities, graphic solutions to inequalities and an "extras for experts" section on symbolic logic. Each topic is introduced and explained with sample algebra problems followed by practice sets of algebra problems with the algebra solutions offered to the student step-by-step. This algebra software is your personal private algebra tutor. Chapter 3: "Linear Functions in Two Variables" - this math software provides algebra help and practice with linear equations, open sentences, graphing, comprehensive study of slope, standard form of a linear equation, horizontal and vertical lines and their graphs, forms of linear equations such as point-slope, slope-intercept, parallel & perpendicular slopes and their linear equations, writing the equation from the information given, systems of linear equations in two variables, linear inequalities, linear functions and relations. Each learning algebra topic is introduced and explained with sample algebra problems followed by practice sets of algebra problems with the algebra solutions offered to the student step-by-step. This algebra software is your personal private algebra tutor. Algebra 1 students will learn this material for the first time and algebra 2 students will review this very important material which is necessary for more advanced algebra studies. Math help is always available. MathMedia Educational Software will be your virtual math tutor. Chapter 4: "Polynomials: Products & Factors" - Factoring polynomials is one of the most challenging topics both basic algebra and advanced algebra 2 students face. The in-depth math software chapter on factoring will provide the algebra help students require. Begin with an introduction to polynomials with algebra help and practice in the basic operations on polynomials, move on to exponents (definitions, rules, multiplication, division, power of a power, and even an exponent "challenge" section; continue with the multiplication of polynomials and prime factoring. Factoring polynomials provides the help and practice required to master common monomial factoring, common binomial factoring, the difference of two perfect squares, factoring cubes, factoring by grouping, factoring quadratics; conclude with solving polynomial equations and polynomial inequalities. Each topic is introduced and explained with sample algebra problems followed by practice sets of algebra problems with the algebra solutions offered to the student step-by-step. This algebra software is your personal private algebra tutor. 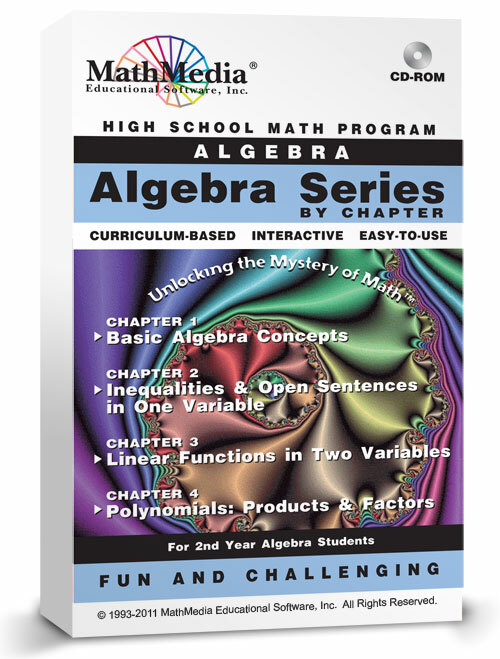 Each chapter offers the students comprehensive details for learning algebra with algebra help and algebra practice. Each math software chapter contains a separate algebra word problem solving section. Students with holes in their math education will receive the appropriate math help necessary for success. Each chapter is available for $49 or purchase this bundle set of 4 chapters for $159.